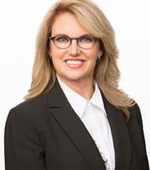 With over twenty-five years of sales management and business development experience in the real estate and pharmaceutical industries, Laurie brings a diverse and experienced professional perspective to the Fort Worth team. She is also a licensed real estate agent and has over 8 years of experience managing and co-owning a successful Fort Worth office of over 45 agents. She has also managed a portfolio of clients, listing and selling their homes and estates for the past 8 years. Laurie's strengths lie in her ability to successfully develop agents matching their skills and services with marketing and sales initiatives in order to serve their clients in the best possible manner. Laurie is a native of Fort Worth, she earned her Bachelor of Science and Master of Science degrees at TCU.